With fall semester in full swing, campus is a hive of activity – and construction is buzzing along in stride. 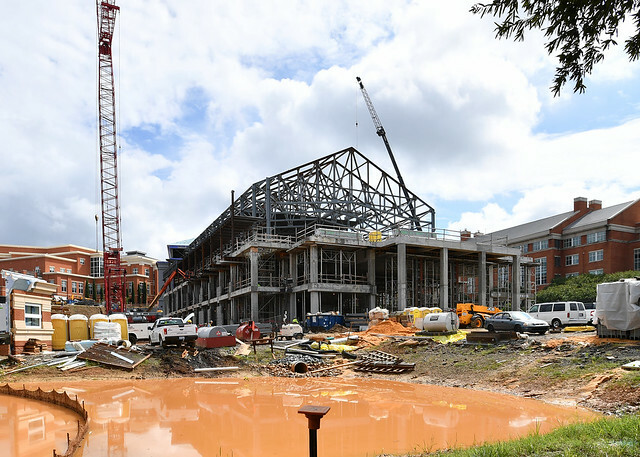 We’ve got the latest updates to UNC Charlotte’s ever-evolving 1,000-acre campus. 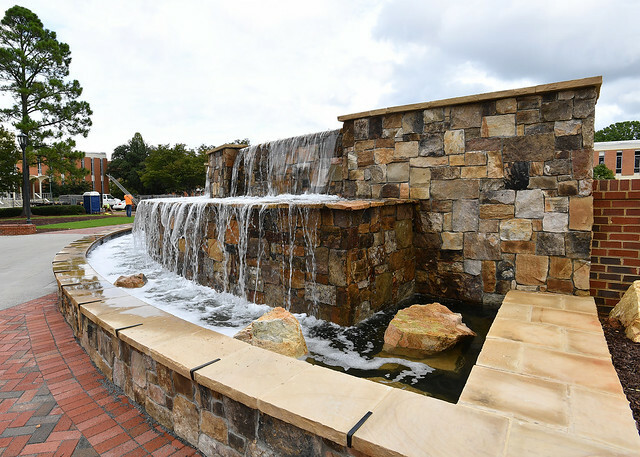 An oval-shaped great lawn, a monumental water element and more pocket spaces for activities are among the major features of the new Belk Plaza, offering a natural gathering spot with outdoor seating and a performance area. “We created a palette that would accommodate just about anything. The functional flexibility of space reflects classic design and introduces contemporary expression,” stated Adam Martin, an associate from LandDesign, the firm responsible for the architectural scheme, and a UNC Charlotte alumnus. The great lawn slopes downward from the crest of the fountain toward Rowe Arts Building and Robinson Hall. The slightly tilted lawn plane provides a space to recline and watch quad activities or amphitheater-style seating for events. A new indoor training facility beside Hayes Baseball Stadium is close to completion. 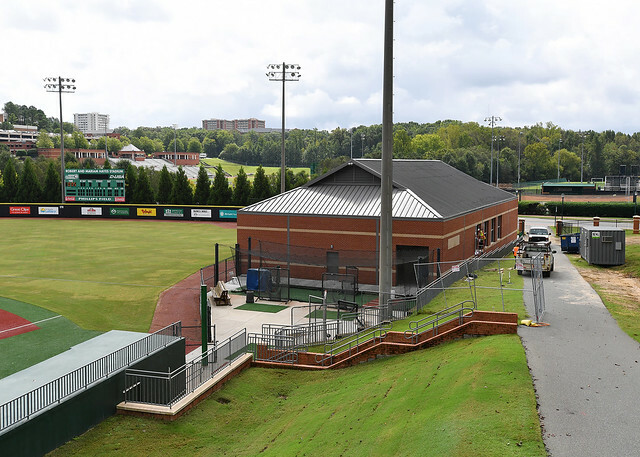 The space allows improved practice schedules to keep the Charlotte 49ers competitive with other collegiate baseball programs, including Conference USA rivals. It also brings cost savings, eliminating the need to rent off-site practice facilities during bad weather. The facility will boast three batting cages and a warm up area, with a brick exterior and a standing seam metal roof in keeping with the campus aesthetic. The University Recreation Center, next to Popp Martin Student Union, will enhance opportunities for physical health and wellness. The 160,000-square-foot center will include aerobic and weight training rooms, group fitness spaces, multipurpose courts, aquatic facilities, locker rooms and space for intramural sports and other recreational programs. Work continues with the installation of structural steel framing, concrete floor slabs and exterior walls. Mechanical, electrical and plumbing rough-ins are in progress, roof installation has begun, and brick work is next. The Admissions and Visitors Center, soon to be the welcoming hub for guests and prospective students, is located just inside the main entrance of Dickson Gate near South Village. It will serve as an information center and a starting point for campus tours. 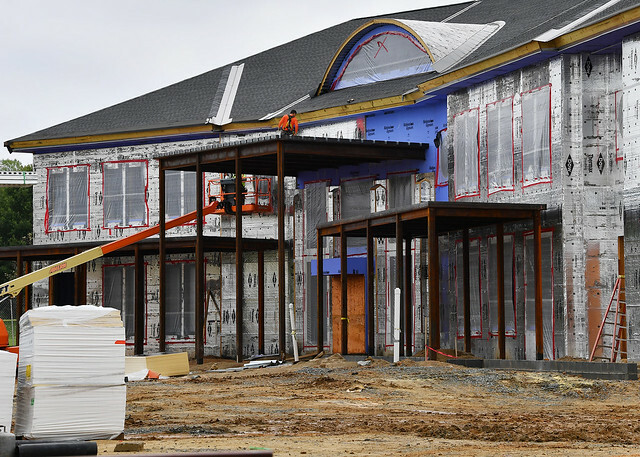 The roof is installed, and work continues to complete interior framing and mechanical, electrical and plumbing rough-ins.